Would you stay at your own hotel? Assuming you didn’t get a free or discounted room. Assuming too, that you weren’t already familiar with the place. No, assuming you found it “cold” using the internet and didn’t get perks, would you still stay at your own hotel? How you answer this question speaks volumes about your hotel’s image online. If you answered “yes” and would stay there; your hotel probably looks good online. Good enough, at least, to convince a stranger (you) to book a room. On the other hand, if you answered “no” and wouldn’t book a room; your hotel’s online image may be less than stellar. Ok, but what makes a hotel look “good” versus “bad” online? That’s the bigger question for us to answer. If we can determine that, your hotel will be able to get more bookings. 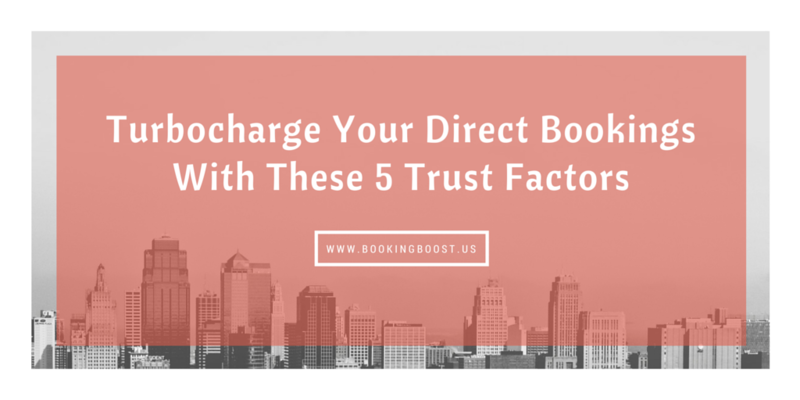 You’ll see this booking boost because more people will trust your hotel, based on what they see online. Naturally, everyone is different and may exhibit different behaviors. We’re all “magical snowflakes”, as it’s sometimes sarcastically put. But even unique snowflakes melt the same way. So if you want your hotel’s website visitors to “melt”, in the sense of warming up to your hotel and making a booking; there are common things you can do. In the post ahead, we’ll cover five of those things. These are five factors which build trust with prospective guests and score bookings for your hotel. Speaking of “scoring”, let’s have some fun with this discussion. Rather than merely going down a list, we can frame the concepts here around football. (That’s “American football”, for our friends in Canada and overseas.) Thinking in those terms, the bookings your hotel is working toward are like touchdowns. Your hotel’s website, in turn, is like the “gridiron”, that 120-yard field on which football games are played. And, finally, the five trust factors we’ve alluded to are like a set of plays. Each play advances your hotel down the field toward the end zone, where a touchdown (i.e. a booking) awaits. Taking this analogy, let’s go into a huddle and work out the 5 plays. The first play we can make is with respect to TripAdvisor. TripAdvisor is a massive website where people post their reviews of hotels and other vacation properties. At last count, the site had over 350 million unique monthly visitors, posting in excess of 320 million reviews for close to one million different lodging establishments. Given these stats, TripAdvisor plays an integral role in most hotel bookings. For better or worse, the site has become the go-to source of hotel reviews. Want reviews for a property? Just head to TripAdvisor and check what people are saying about the place. And often you don’t even need to remember to check TripAdvisor. The site is so gargantuan that its pages of reviews regularly pop up, on their own, at or near the top of Google’s search results. So even if your prospective guests don’t go looking for TripAdvisor reviews, they’re practically guaranteed to find the reviews anyway. This is the reason that our first “play” is based around TripAdvisor. Let’s think about TripAdvisor as a big defensive linebacker. As a linebacker, TripAdvisor’s job is to keep us from rushing ahead to a booking. We’re not saying that TripAdvisor wants to keep us from bookings. Not necessarily. Rather, the site slows down our advancement in the same way as a linebacker can slow down the opposing football team’s progress. In our case, as a hotel, we want to get by TripAdvisor without being “bloodied” and figuratively knocked down. TripAdvisor can do that to our hotel, if we’re not careful. Plenty of other hotels have been hit and left with a limp that impedes their ability to score touchdowns. We don’t want to suffer a similar fate, so we need to tread softly around TripAdvisor. If we want to get by this “linebacker” and gain some yards, we’ll need to get good reviews for our hotel. That may sound obvious, but it’s not as straightforward as you’d expect. Often, guests have to be encouraged to leave reviews after they stay. You might have to go out of your way and ask them to spend a minute on TripAdvisor reviewing your property. Only then would you get positive TripAdvisor reviews or even reviews period. Then there’s the issue of negative TripAdvisor reviews. Get one and it’s seemingly “game over” for your hotel. But it doesn’t have to be. 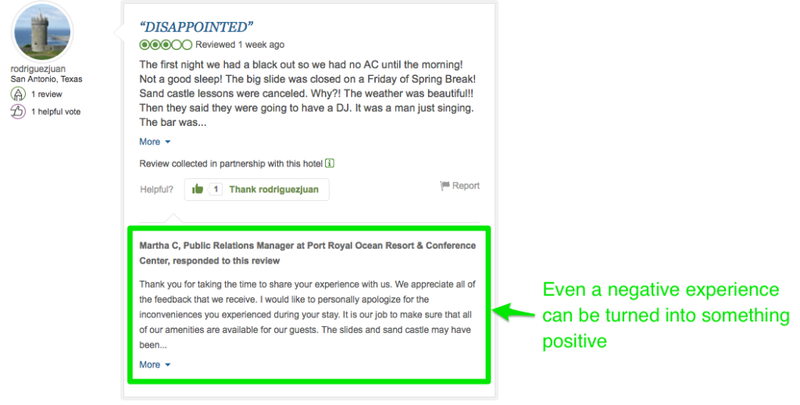 If you respond promptly and in a professional way, your hotel can mitigate the damage from negative reviews. The reviews will still sting, but your hotel probably won’t feel as much of a burn in terms of bookings lost. That’s because people reading the reviews will see that you care enough to read what reviewers are saying and respond. There’s also the chance that, depending on how you respond to a bad TripAdvisor review, you could actually win some new fans too. If you go out of your way to “make things right” with the writer of the bad review, your hotel could come off as a concerned, sympathetic hero. We’ve all heard stories about this sort of thing happening, for example, when a company gets a PR coup by responding with extraordinary generosity to an aggrieved person on Twitter, Facebook, and other platforms. TripAdvisor is no different and a massive act of generosity could be just what it takes to complete this first play. Google. Ever heard of it? Of course you have. You’re not living under a rock, after all. Neither are your prospective guests. They’ve heard of this “Google thing” too. And you can bet that prospective guests will be checking your hotel out on Google. For prospective guests, Googling your hotel is as much about information as it is about status. Sure, many prospects do want to get more information on your hotel. When they type your hotel name into Google, these prospects are genuinely looking to get the facts on your hotel. But a Google search also reveals the status of your hotel, at least as it exists online. If your hotel doesn’t appear in Google search results, it’s as though the hotel doesn’t really exist. At least not to those searching. More likely, though, your hotel will appear but in connection to another website. Here, “Googlers” would see your website listed as part of a booking website like booking.com. This is a bit better, in terms of how you look online, but it’s still not a good play. What you really need to succeed on Google is a website of your own, for your hotel, ranked first or near the very top of search results. That’s what instills trust in prospective guest’s minds when they do the inevitable Google search. 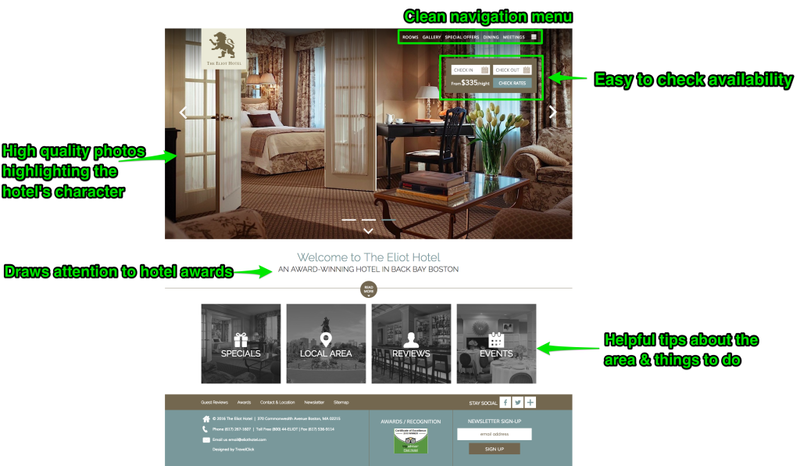 To illustrate how you use Google the right way, let’s look at the Eliot Hotel. This Boston-area hotel recognizes that Google is one of the trust factors that determines whether your hotel will score bookings. Knowing this, the hotel’s management has evidently focused on getting a #1 Google ranking. We can see this in a recent screenshot of search results that appear for the term, “The Eliot Hotel”. No, Google results don’t come with green boxes and arrows. Those are our own annotations. The annotations are there to highlight a few points. 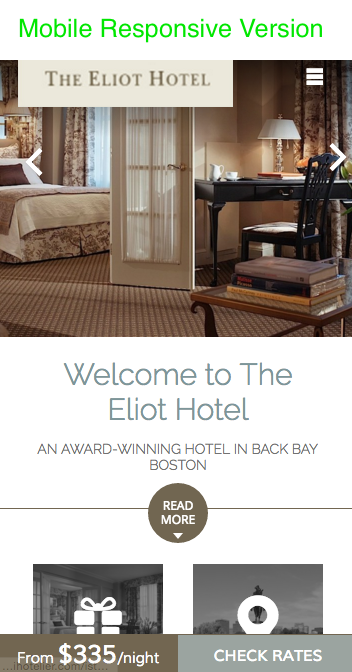 First, out of 368,000 results; the Eliot Hotel’s official website is number one. That’s number one after paid ads. So in the free “organic” search results; the Eliot Hotel stands supreme. 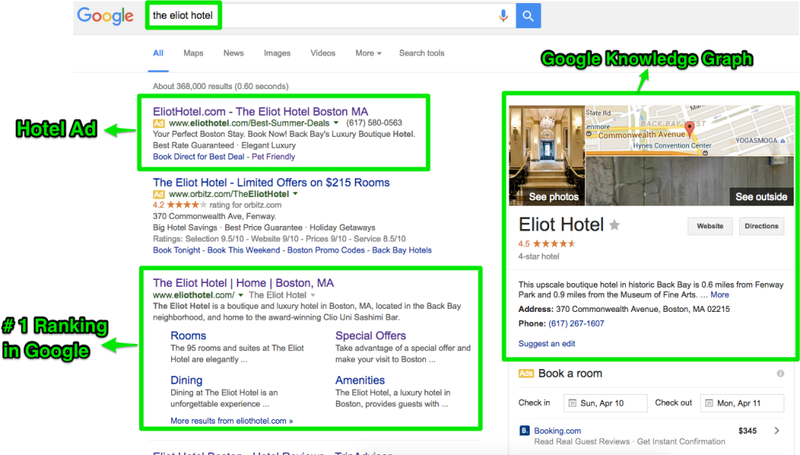 In addition to having a #1 ranking, the Eliot Hotel also has a powerful profile (“Knowledge Graph”) that shows up with their Google search result. Look in the screenshot above and you can see what shows up for the Eliot. Just look at the green box we’ve drawn in the picture on the right. Now that’s some good writing. The descriptions make the Eliot Hotel sound like a very desirable place to stay. You might want to book a room after reading lines like, “boutique and luxury hotel” and “award-winning Clio Uni Sashimi Bar”. These kind of lines are going to effectively sell the hotel to strangers who find it online in a Google search. A strong Google presence probably won’t be the final factor in scoring a booking “touchdown”. But it will help to greatly advance your prospective guests a few more yards down the field. We all know that you shouldn’t judge a book by its cover. It’s only reinforced a bazillion times while we’re growing up, and then to the point of cliche in adult life too. We shouldn’t judge a book by its cover, but we do. And we behave that way with books, people, and – yes – hotel websites too. For the latter, hotel websites, prospective guests will be quick to judge your hotel based on what its site looks like. This is one area where looks do kill. If your hotel’s website isn’t looking sharp and dressed to impress; you’re going to have a hard time gaining trust with prospective guests. You may have gained their trust in previous plays, but those yards can easily be lost due to a poorly designed website. When we say poorly designed, we’re talking about two things. The first one is appearance. Is your website, for example, noticeably outdated in its design? How about with respect to mobile, does your website display properly on mobile devices? These kind of appearance-related issues will cause website visitors to make immediate judgments about your hotel. Often those judgments are not ones you want them to be making either. Over 50% of Google searches come from mobile users. Make it easier for them to book by having a mobile responsive site. Also essential to your site’s success is functionality. Does your website work? Do all of the pages, links, and other content display correctly? If your hotel has a direct booking or reservations system, does this system smoothly process bookings? These kinds of questions on functionality need to be resolved in order to build trust among prospective guests. Your website may seem like a separate entity from your hotel. Something you can fix, “one of these days”. But the reality is that prospective guests don’t see it that way. To them, your website is an extension of your hotel. Looking at the site, if they see it hasn’t been maintained; this suggests you may treat your hotel the same way. Maybe you’re equally lax on not keeping up the building, not responding quickly to complaints, or just generally letting things at the hotel fall into disorder. Is that crazy? Yes. But it comes back to what we’ve said about judging books by their cover. If you want to pass your prospective guest’s judgment, your website needs to look the part. Only then can you build trust and get further toward a booking. Now we’re getting somewhere. Almost to the end really. With this play, we’re within spitting distance of the end zone and that touchdown. This play relates to the online reservation process. By now, your hotel has addressed TripAdvisor, Google, and the design of its website. Those are all instances where trust has to be built with a prospective guest. Now that some semblance of trust has been formed, the next hurdle is the online reservation process. As we’ve said, we’re now very close to a touchdown. One of the last things that can trip us up is our own process for making online reservations. In a football analogy, this is comparable to a fumble or a player tripping over the laces on their cleats. Sounds stupid, right? That’s the point. We’re so close now that it’s going to take a stupid, internal mistake to derail the reservation. But those mistakes happen. Oh do they ever. So you need to have an online reservation process that works so well it’s practically bulletproof. Your reservations process can be defined as the experience the user (i.e. the prospective guest) has while they go through a booking on your site. What’s it like for them as they try to enter details and move between one or more booking screens? Is it simple and straightforward to make the reservation on your website? Or is there anything confusing about the process? Security and dates are also important. With security, how secure does your booking system appear? Does it use visible measures like an SSL certificate, which encrypts data like a user’s credit card number? On dates, is your hotel’s calendar accurate and updated? Inaccurate dates will make your hotel look unprofessional and lead to that awkward, “actually you can’t stay here” conversation later. If your hotel is going to make the booking, you need a system that doesn’t have these issues. Your system should be free as well from “immovable” obstacles like a difficult to read CAPTCHA verification code or too few payment options (i.e. Visa only). We’d also recommend that your booking system not throw in any “cheapskate” fees. These kind of fees are thrown in at the last minute without prior warning. An example would be a credit card processing fee that isn’t stated until the last possible moment. Fees like this could leave people thinking that there was something of a “bait and switch” about your booking process. Like tripping over your cleat’s laces, this may sound equally stupid. But really, you’ve come too far toward a booking to falter like this. Don’t make such an easily avoidable mistake. Phone support is the last play in our path down the field toward a touchdown. At this point, depending on how your reservation process is set up, the prospective guest may call your hotel to complete the booking. If calling is an option for bookings, you need to have excellent phone support. Anyone answering the phone must, for example, be polite and professional to the prospective guest. Anything to the contrary will shatter the trust you’ve built up with the prospect. This trust originally led the prospect to call your hotel and attempt to make a booking. But without good phone manners on your staff’s part, the prospect won’t complete the booking. Phone bookings matter too, as seen with Booking Boost’s official data from working with a variety of hotels. In our work, we saw that 30-40% of bookings are still coming in over the phone. What a shame then that some hotels don’t do a better job of training and managing their phone staff. With just a bit of effort on the phone, these hotels could easily get more bookings. Hotels who handle all of their bookings online should also pay attention to the phone. While hotels with an online system don’t need a phone to get bookings, they do need the phone to keep those bookings. Just because a booking has been made, there’s still a chance that it can be canceled. If an incoming guest has a bad experience when calling your hotel, that experience could unravel their trust and lead to a cancellation. Play it smart. Play it cool. And use phone support as the final play to score a touchdown for your hotel.